Gline Clarke talks from experience, says Goverment should help folks build a home! 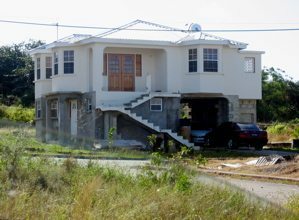 Government Minister Clarke: love nest on expropriated land. Barbados news media let it pass! Gline Clarke, Member for St. George North, said in Parliament the other day that government should be giving long term land leases and help folks to acquire mortgages to build homes. Fair enough. On this small island where land is at a premium and Town Planning permissions to build turn scrub land into gold, there has to be some government control and oversight. But without Integrity Legislation and Freedom of Information, who will watch over the government people? So give folks access to land and homes. Well, that’s something else, isn’t it? How about it, Mr. Clarke? In five years you haven’t answered the people of Barbados about how you, as a Minister of Government, ended up living in a home on land that your government expropriated. Your government never paid for the land after expropriating it, but that’s a pretty common story ’bout hey. Man, if this was New Jersey or the UK, the news media woulda been all over the story. But this is Barbados. So the newspapers ignored the story, but the people and the blogs doan forget! Barbados Advocate: Opposition MP wants government allocate land to the poor.